According to the Program for International Student Assessment, 22 percent of American teens lacked basic financial literacy skills in 2015, with financial literacy being defined as the ability of 15-year-olds to apply their knowledge and skills of financial issues to real-life situations. That is a scary statistic when you consider that Americans paid $104 billion in credit card interest and fees in 2018. This is a 35 percent increase since 2013! The situation will only get worse if we don’t teach younger generations how to be more fiscally responsible. As parents, we want our children to have the best lives possible, so now is the time to start teaching them financial literacy skills. 1. Instill a knowledge of wants vs. needs – and opportunity costs. Children as young as preschool can begin to learn the difference between things they want and things they actually need. As they grow older, start teaching them about the opportunity cost of their purchases. Opportunity cost is what they are going to miss out on if they make a certain decision. For example, they may choose to spend “only a dollar” on a candy bar today, but that means they will have to wait for another allowance to cover the cost and tax of an item they have been saving up for. Don’t help them by loaning money until their next allowance. After they make a decision, let them learn from it. 2. Give kids their own debit card to access their allowance. When our children see us pay for items with our credit or debit cards, they sometimes start to believe that there is a never-ending supply of money on that card. As long as we have the card, there should be money, right? Give your child the hands-on knowledge and responsibility of learning about needing to have money in the bank in order to use the card. There are many companies that offer debit cards for children to use, such as famzoo, greenlight and busykid. Some banks are even starting to create cards for kids’ personal bank accounts that are linked to yours. You can deposit their allowance right on the card, and then they can find an app to balance their account and keep track of what is in there. 3. Have kids build an “emergency fund” and use it correctly. As an adult, your emergency fund can be the only thing that prevents you from losing everything when there is an emergency. The earlier your child learns about an emergency fund, and the importance of having one, the better off he or she will be. Explain that this is different from a savings account, because it is only to be used for unexpected things that come up. Money can not be “borrowed” from this fund. The bigger the fund the better – especially as they grow older and the emergencies go from helping to replace a window they broke to helping to fix a car they crashed. Agree together on a set minimum limit for the emergency fund, and build it to that number by setting 10 percent of their allowance aside for this fund. Once it hits that number, make sure money is only used for something that is truly an emergency. (No, a sale on something they have been saving for doesn’t count.) If the money does get used, it is to be replaced immediately before any wants are purchased, even if that means they take anywhere from 50-100 percent of their next allowance to do this. 4. Teach them the cash-envelope system. Being disciplined enough to only use cash for spending is one of the best ways to live within a budget, and the easiest way to do this is the cash-envelope system. The basic thought behind it is that if you don’t have cash in the envelope, you don’t buy it. Keep it simple with five envelopes: wants, needs, giving, an emergency fund, and a savings fund. When children receive an allowance or other money, teach them to separate money into each envelope according to your budgeting agreement, such as 15 percent for needs, 5 percent for giving, 70 percent for wants, and 10 percent for emergencies. When your child is very young, “needs” can be combined with emergency for when they need to pay for something they accidentally broke or perhaps can be used to buy their sibling an ice cream cone after an argument or to replace a toy they lost. As they get older, “needs” might include paying for their cell phone bill or replacing items they break/lose. Later, that money can be allocated towards their gas or pitching in for their car insurance. 5. 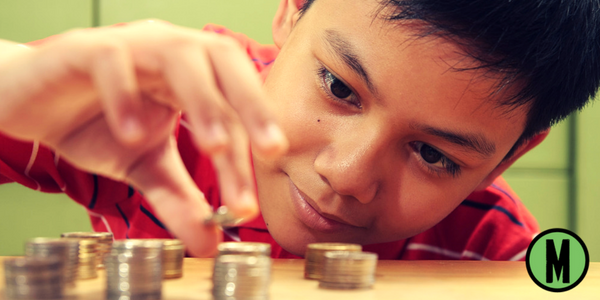 Help your children create their own budgets, and allow them to help with a family budget. Budgeting is not something that comes naturally to everyone. In fact, many people don’t even learn how to do it until they have already gotten into some money trouble. Creating a budget for our children can be difficult since they often don’t have regular monthly expenses, so theirs can be kept simple, such as a contribution to the family vacation fund, money into each of their cash envelope accounts, and money towards a big-item purchase that they have researched. If possible, give your child the responsibility of tracking a small item on the family budget, such as family night out or vacation spending. Let your child know how much you are able to spend on family night out, and then help your child to plan it by comparing costs of different activities and making those choices. For older kids, you can give them money to make purchase choices when you are out. 6. Show your child how to comparison shop for large items. The first time my son made a big purchase, it was because he wanted to get his hair dyed professionally (a good choice, as I would not have been able to pull off the green/blue combo thing using a home kit). I wasn’t necessarily a fan of the idea, but he researched a place that had good reviews, then saved up his money, including a 20 percent tip and tax. Since that time, whenever he wants me to take his splurging wishes seriously, he researches them first. Not only does he compare different places and prices, but he also checks reviews and alternative items and looks for any promotions to help lower the price. He takes his purchases much more seriously – and it opens his eyes to how widely different prices for the same item can be.